Box is announcing today that it has released one of the first business applications you can get for Windows 8, Microsoft’s newest operating system. Called Box for Windows 8, this new app gives the company a well-rounded line up of products that cover all platforms, including native applications for the Blackberry, iPhone, iPad, Android phones and tablets. With this new offering, users will be able to leverage Box’s functionality and deep integrations into the Windows 8 platform in order to have a full-featured cloud storage and collaboration service. Some of the new features that the app will allow users to do include being able to access, view, edit, share, and manage their files directly on any Windows 8 device; share files and folders; pin live tiles to the Start screen to see updates on files by colleagues; view photos with slideshow viewer for folders; manage files and folders with batch move, copy, and delete operations; and much more. This new application is not your typical Box app — it’s built completely to work within the Windows 8 framework. As mentioned in its blog post, Box includes all the features that are on the other mobile apps, but it also leverages the built-in platform functionality necessary to create an integrated experience with Windows 8. Security is included in this new product. Box for Windows 8 includes single-sign on (SSO) login support — basically the ability to allow a user to log in once and have access to all systems without being asked to log in each time, and a passcode lock feature so that you can feel secure knowing that your company’s credentials are well-protected. With Microsoft traditionally being favored by the enterprise, this app should be an interesting and welcome addition to any company. Not only is it cloud-based, but it can adds a level of familiarity because it’s developed for a Microsoft product. And seeing that Box has more than 14 million users, of which 92% of Fortune 500 companies are a part of, there is precedent for companies to adopt the service. To incentivize you to try out the app, Box is giving away, for a limited time, 25 GB of storage plus Box Sync on any HP Windows 8 device — you can use Box Sync on the desktop portion of Windows 8. Additionally, if you sign up for a Box account from the Samsung ATIV Tab, you can get a 50 GB account. 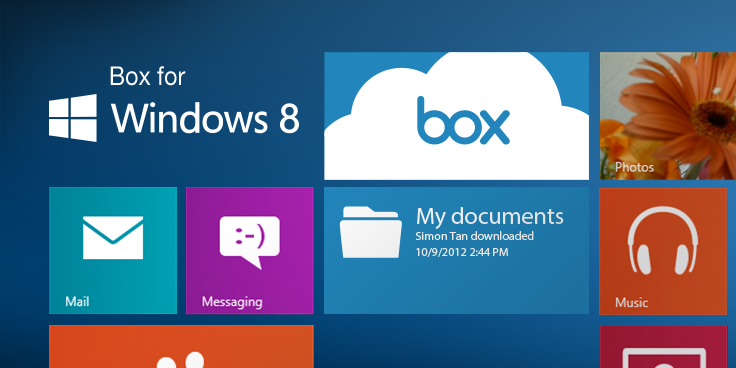 Box for Windows 8 is available starting today as a free download in the Windows Store.